The first episode is an interview with the Democratic presidential nominee. While the Obama administration’s deep social media game has basically made it de rigueur for politicos and would-be politicos to master the latest and greatest digital obsessions, the Clinton campaign has upped the challenge by coming out with its own podcast, called With Her. 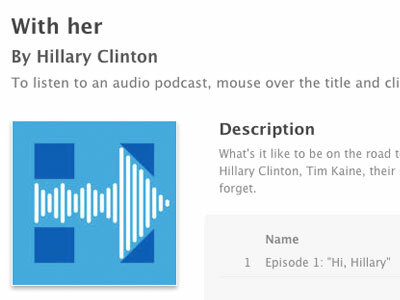 The first episode, titled, Hi, Hillary, is out now and features Clinton being interviewed by her co-host, Longform co-founder Max Linsky. If you’re a regular podcast listener, you’ve probably been conditioned, upon hitting the play button, to drift through an introduction layered under some instrumental music, but Linsky gets right into it. “Before we get started, I have a question for you. What do I–What should I call you?” he asks Clinton. “I’m not going to call you ‘hey, you,’ but I’ll call you Hillary,” he responds. Cue introduction layered under some instrumental music.